I have been enjoying learning about knee health and really appreciate the information you have compiled and share. I wonder if you have also studied the affliction of poor posture and stooped/rounded shoulders? (…) I learned through learning Pilates that it could be a fixable problem. I have seen improvements but after reading a link you referenced on cross over shoulder pain I wonder if there would be specific steps to follow in releasing some muscles and then strengthening others in an order similar to what you have taught with good knee health. For my upper body, I use the following three techniques to achieve better posture and prevent rounded shoulders. You will know when you do this drill correctly the moment it becomes much harder. Don’t cheat yourself out of the benefits by letting your lower back, elbows or hands come off the wall. If you find the exercise too difficult to do on the wall, you can do it lying on the ground. The same technique applies. If you still can’t get your elbows and hands to touch the floor, hold on to some very light weights (I’ve learned this variation from Steve Maxwell). Do this exercise at least twice per day. My dad used to say only have to “stand up straight!” I tried that approach for years, but it didn’t work. Standing up straight was much too tiring and I couldn’t do it for more than a minute. Things changed dramatically when I got into strength training. After a few months of training, standing up straight for a long time had become so easy it was unbelievable. The two exercises that gave me the greatest results were inverted rows and chin-ups. Other exercises for the upper back probably work just as well, but I like to keep it simple. Both exercises require different movements (vertical pulling vs. horizontal pulling) and thereby work different muscles (some of which are the same for both exercises). It’s worth mentioning that you don’t need to be a world champion at rowing and chin-ups to benefit from these drills. As a male, if you can do at least 7 chin-ups and 10 inverted rows, your back is strong enough to stand up straight. If you’re not strong enough yet to do chin-ups, do lat pull-downs instead. Another alternative is inverted rows with bent knees or with the body at a steeper angle (i.e., you’re more upright) to reduce the level of intensity. Another great tool is banded stretching exercises. I’ve first discovered these drills through Ido Portal. To do them, you need an elastic band and some place to anchor it on the wall. Having an ergonomic workstation is also important for improving posture. The better your posture at work, the easier it will be to keep your shoulders from rounding forward. Your chair should be high enough so that there’s a 90-degree angle between your calves and your hamstrings. The table needs to be high enough so that there’s around a 90-degree angle in your elbows as well. The angle in your elbows can be a bit higher, but shouldn’t be below 90-degrees. The steeper the angle at which your forearms meet the desk, the more stressful it will be on the wrists. 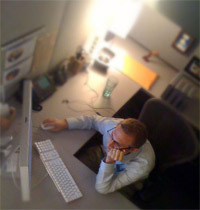 The forearms should be able to rest on the desk, with the elbow at around a 90-degree angle. I’ve found it beneficial to put some padding under the wrist with which I operate the mouse. If I don’t do this, I risk getting wrist pain. Your upper body should be vertical, with your head resting on your shoulders. Your head should rest in such a position that if you were to relax your neck completely, your head would stay aligned for a brief moment and then fall forward or backward with a 50-50 chance. If your head immediately falls forward when you relax your neck, you have a head forward posture that puts excessive stress on your neck. As a result, you might get tension headaches and other problems. Work on aligning your neck properly in the exercise you did in step 1. The upper part of the monitor should be just below eye level. The lower the monitor, the more you’ll be tempted into hunching over (as your head is forced to tilt down for your eyes to see the monitor). The absolute worst for your shoulders and posture is working on a laptop that is placed on the desk. Only do this when you’re travelling, as it forces you into very bad alignment. When you’re at home or at the office, get an external keyboard and a mouse. Next, place the laptop on a big box or a whole bunch of books so that the upper edge of the monitor is just below eye level. It looks goofy, but you’ll be surprised about how awesome it is for your posture. Laptops are the bane of proper posture if you use them without any adaptations. I’ve also heard of stand-up workstations and some people that work walking on a treadmill. You can try that and if it works for you, great. I wasn’t 100% satisfied with the results I got. I found that when I was standing, my concentration was always divided between my work and shifting my weight from one leg to the other. Instead of a stand-up workstation, I found getting up more often and doing some mobility drills to be more beneficial. That actually increased my concentration and creativity.